Finally, I’ve reached the very end of my 2015 Japan trip posts! 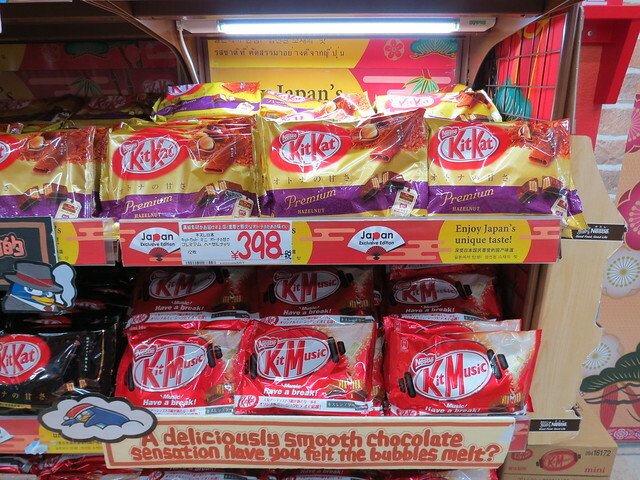 It only took me six months… I thought I’d finish with a quick post about a theme which ran through my whole trip – Kit Kats! 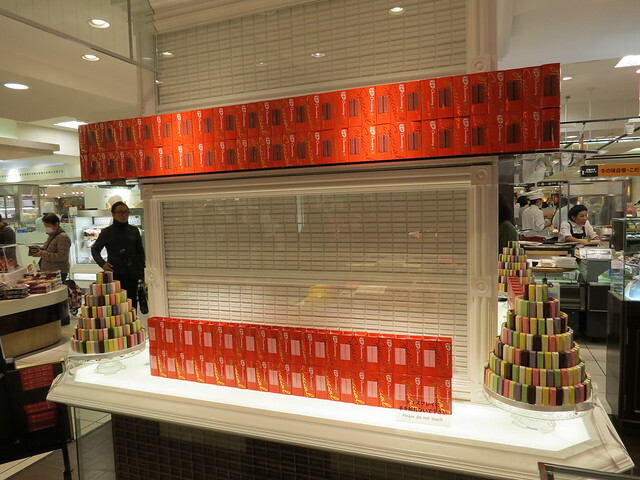 Back in 2014 I had the pleasure of visiting the first Kit Kat Chocolatory in Tokyo. Now there are eight stores across Japan, and I visited two more last year. 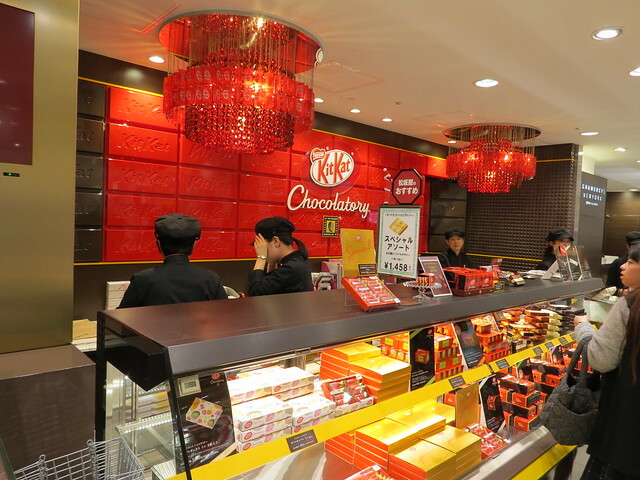 I really want one of those Kit Kat chandeliers! In the store in Nagoya I got a ‘Sublime’ set. 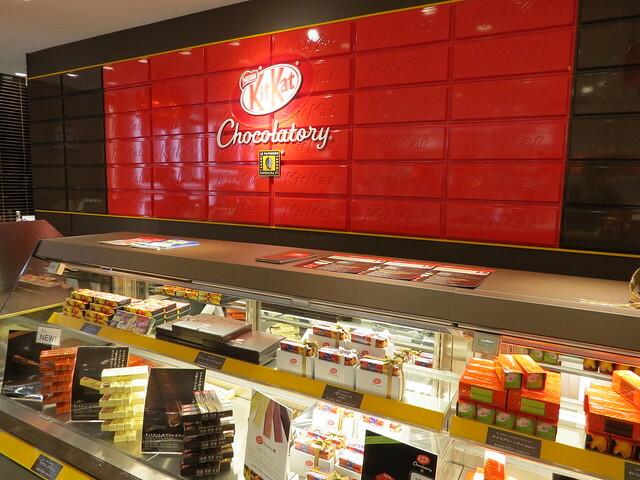 Sublime is a special range of Kit Kats only available at the Chocolatory stores. They are single finger, high quality chocolate bars, and they are really delicious! 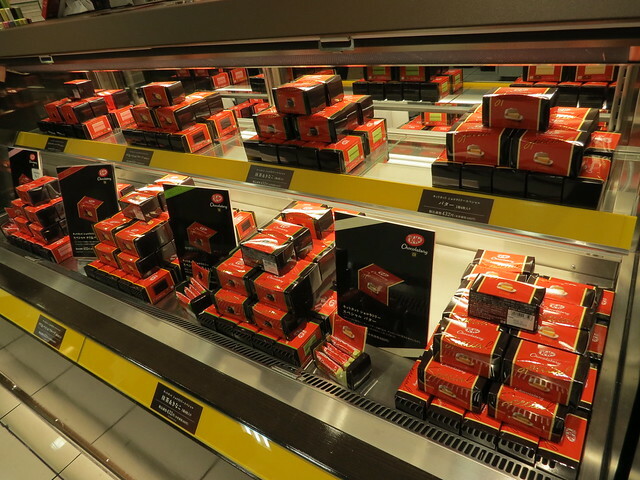 I also discovered the chili and passion fruit and the orange cocktail noir flavours in the ‘Special’ range – yum! 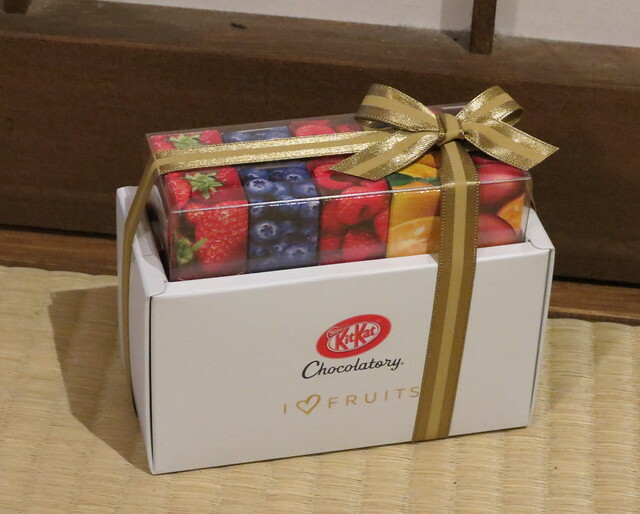 The Kit Kats came in yuzu, passion fruit, raspberry, blueberry and strawberry flavours, and they were really fruity! I also bought some of the ‘Special’ gift boxes as gifts for Christmas. These include the flavours: butter, pistachio & raspberry, strawberry maple and green tea & kinako. The butter ones are too sweet for me, but the others are great – especially the pistachio & raspberry ones. 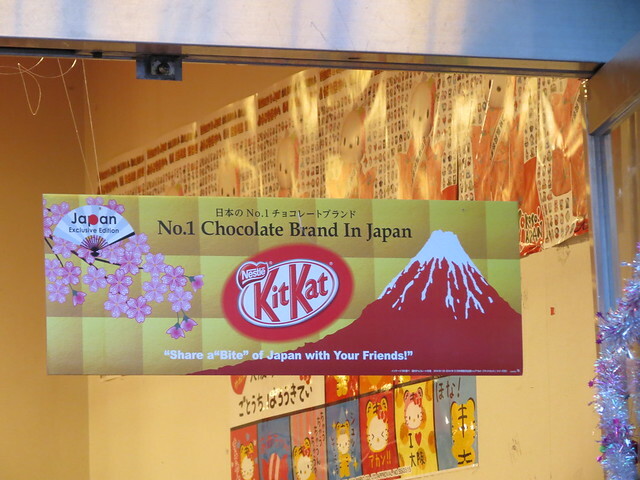 Kit Kats are crazy popular in Japan! There are regional and seasonal varieties, and now all the major souvenir shops in cities and airports stock the most popular flavours. 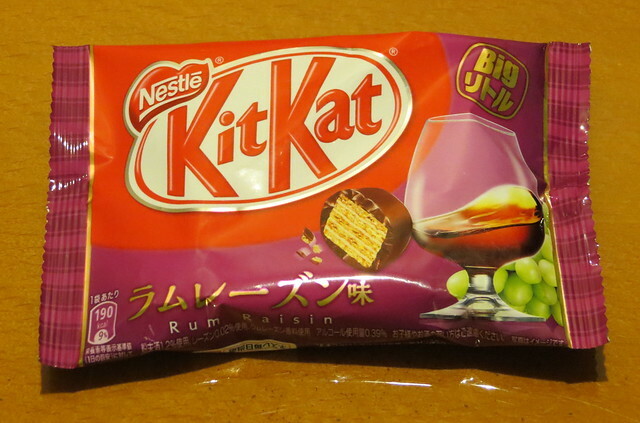 It’s incredible to think that a humble English chocolate bar is now a massively popular Japanese souvenir simply because the name sounds like the phrase ‘kitto katsu’ which means ‘you will surely win’. 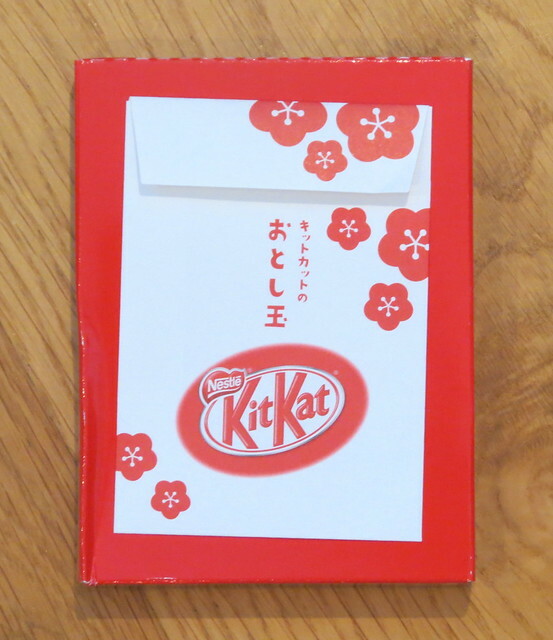 Kit Kats were launched in the UK in 1935 as a simple treat (originally being called ‘Rowntree’s Chocolate Crisp for the first two years) and did not make their way to Japan until 1973. 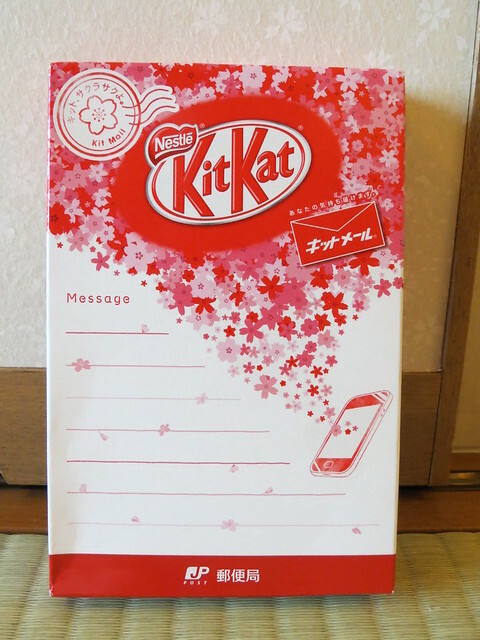 It wasn’t until about 14 years ago that Nestle realised people were buying Kit Kats to give as good luck gifts for students taking university entrance exams and jumped on the idea with a marketing collaboration with Japan Post. 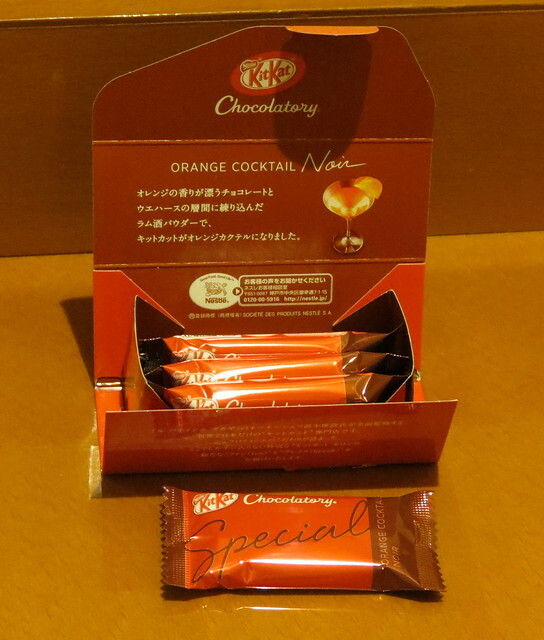 The first ‘postable Kit Kat’ was then launched in 2009. 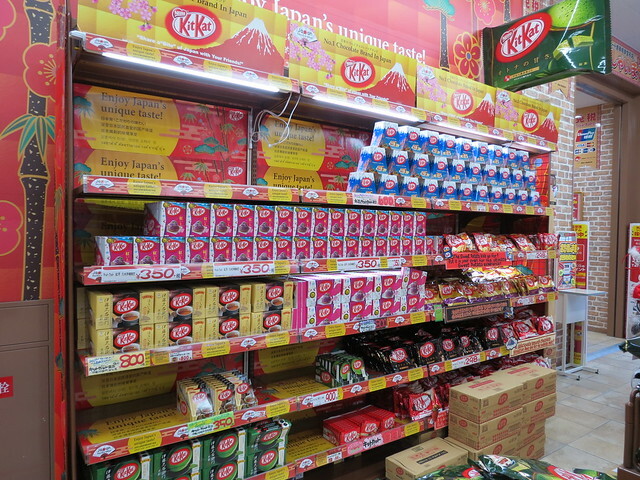 There have been over 300 different flavours of Kit Kat in Japan and more are being created all the time. Top patissier and chef Yasumasa Takagi of ‘Le Patissier Takagi’ is the mastermind behind the unique flavours being sold at the Chocolatory stores, and it is his creations which are taking Kit Kats from being a humble tea-time treat to being a luxury brand which consumers are willing to queue for. 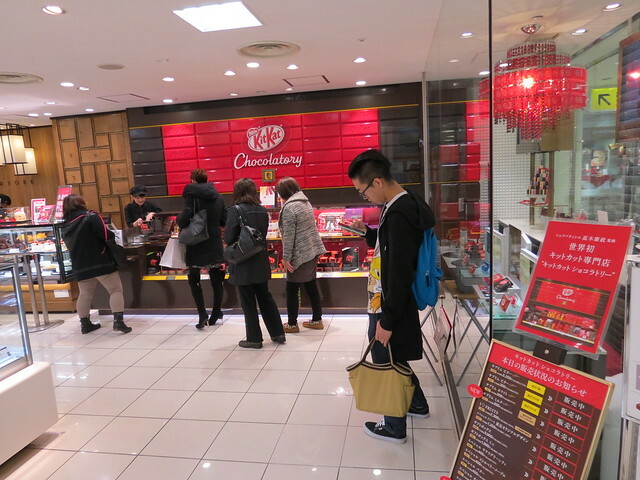 You can’t go anywhere in Japan these days without running into a Kit Kat! 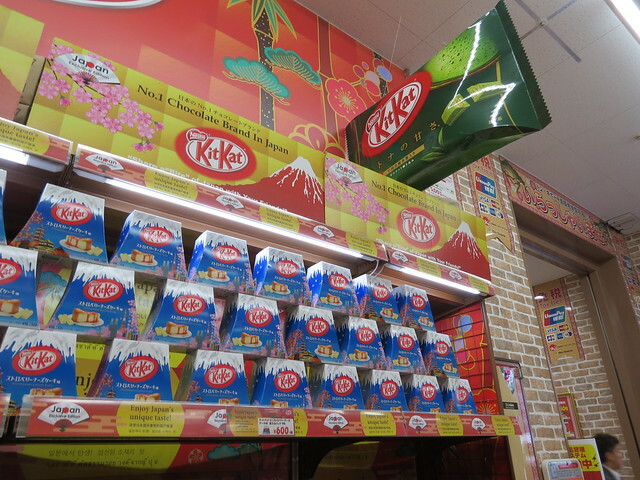 Of course, matcha green tea flavour Kit Kats are still one of the most popular souvenirs. These days the main matcha flavour that is available is in the ‘Adult Sweetness’ range. This bizarrely named range is supposed to appeal to the adult palate more than that of the child, apparently, due to being slightly more bitter. 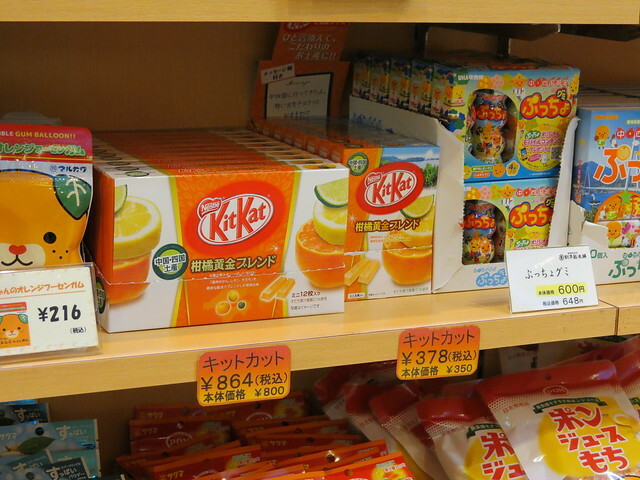 As I travelled around in Shikoku I found some regional flavours – these citrus fruit Kit Kats are really zingy! 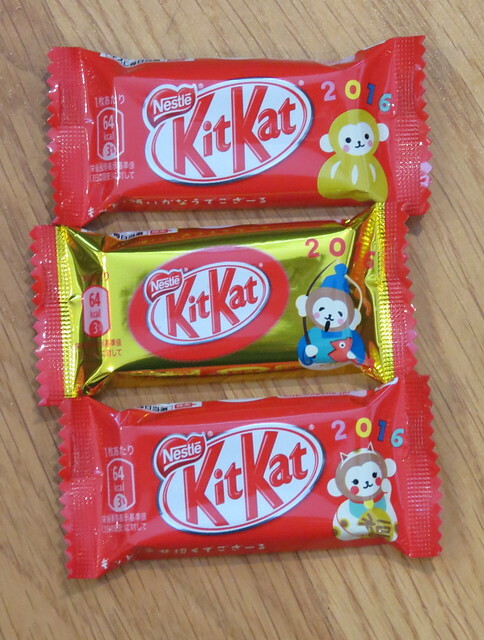 One of the seasonal varieties in December was Rum Raisin ‘Big Little’ Kit Kats – I love this range, and rum raisin is my favourite flavour! 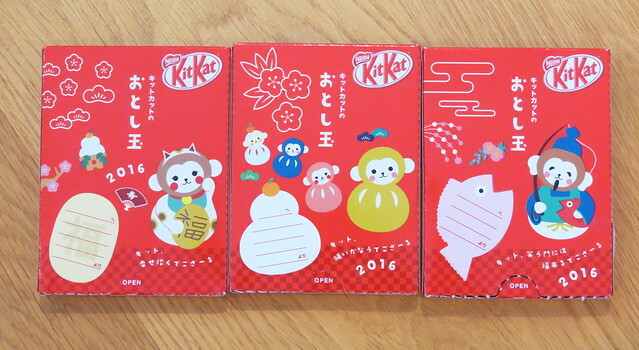 Special New Year Kit Kats were also on sale. These have an envelope attached for the ‘otoshidama’ – a monetary gift given to children for New Year. 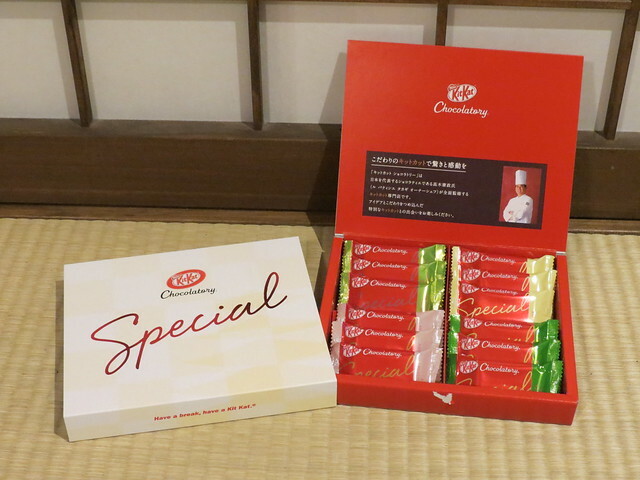 Sometimes Kit Kats are even used in collaborations with other companies. 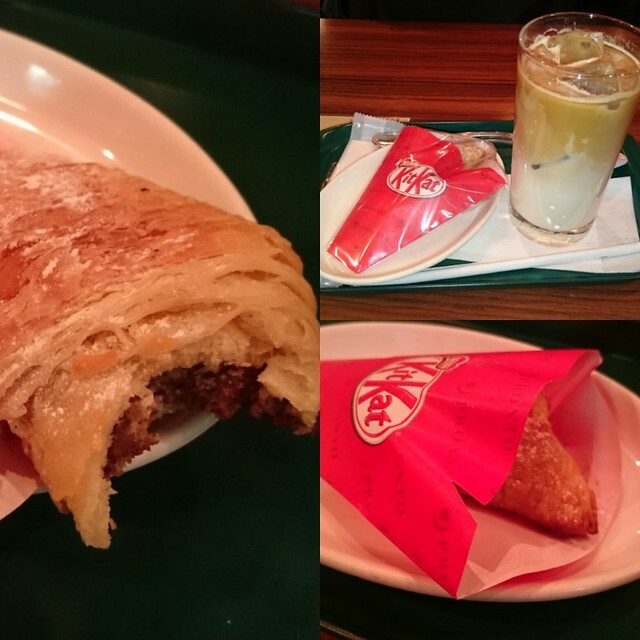 I heard that the cafe chain Pronto (プロント) was serving Kit Kat croissants as a ‘Kit Kat For Cafe‘ promotion and managed to seek one out in Kyoto! It was pretty good, but the smoky cafe wasn’t somewhere I would want to return to! 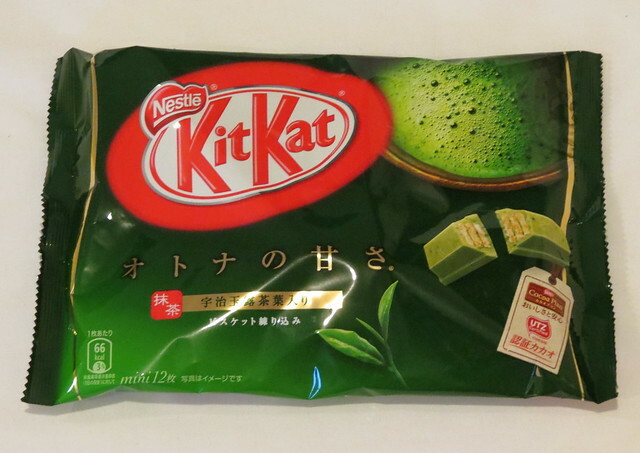 There is apparently a green tea Kit Kat croissant too, which I wish I could have tried! Kit Kat: No. 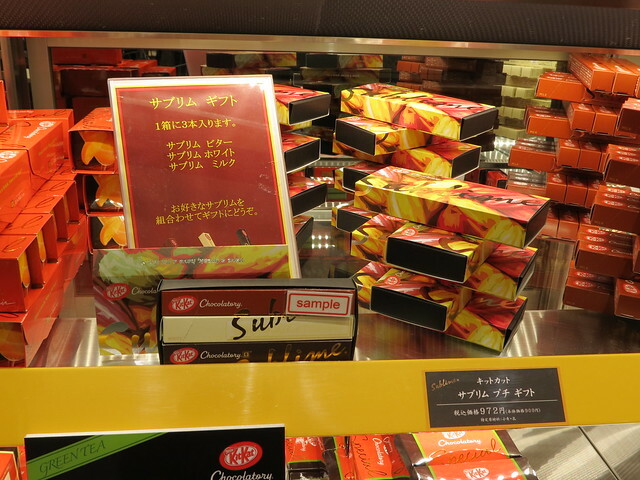 1 Chocolate Brand in Japan! Share a ‘bite’ of Japan with your friends! 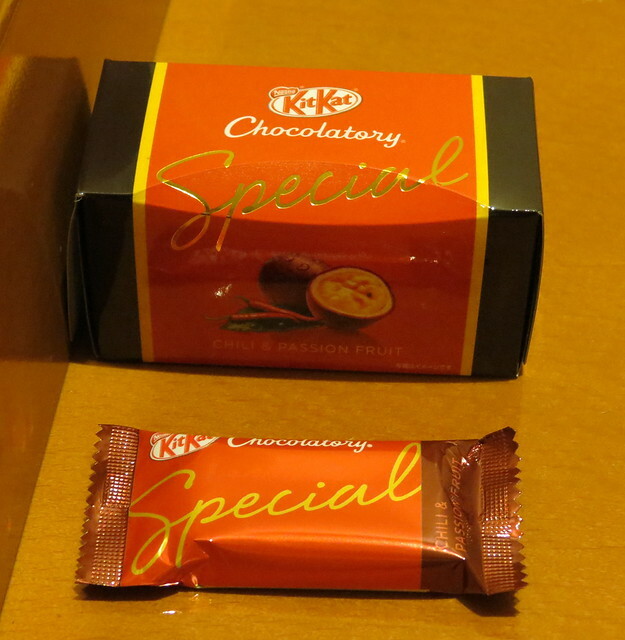 Don’t forget, if you like all things Kit Kat you can see more over on my other blog, Kit Kats! 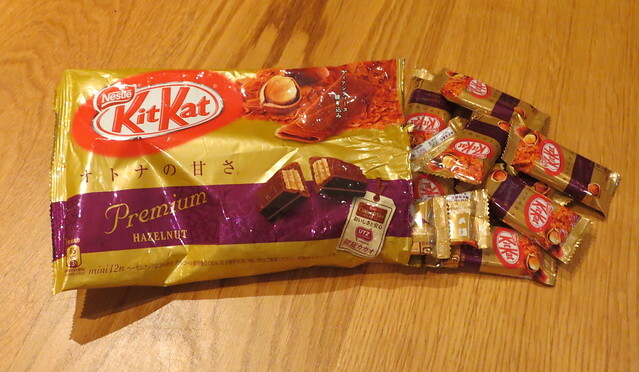 A friend of mine just got back from Japan and was talking about all the crazy Kit Kat flavours! He brought us back some matcha, and strawberry flavour ones to try out, they were really good! « Japan 2015: Birthday Celebrations at DisneySea!